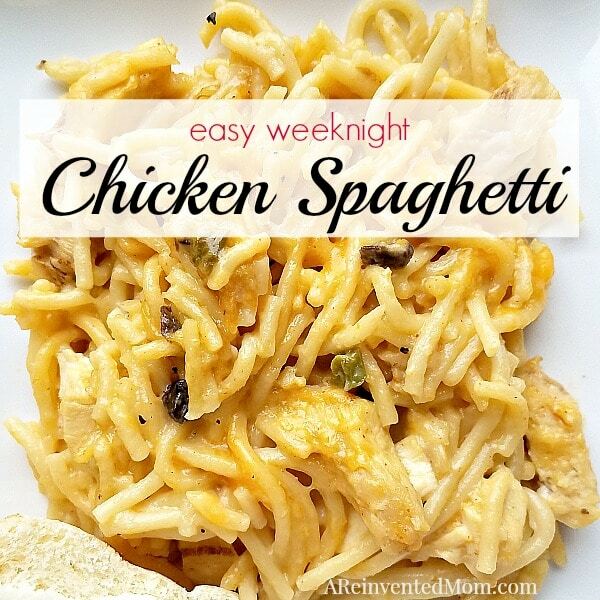 Easy Weeknight Chicken Spaghetti – who says comfort food can’t be easy? Like many of you, I am always on the lookout for easy weeknight meals to feed my hungry family. Who has the time (or inclination) to spend hours in the kitchen after a busy day of work and running kids around to activities? Favorite comfort foods are usually relegated to the weekend menu due to weekday time constraints. But what if we crave (or need) a little comfort food during the week? Just a few simple shortcuts have transformed Chicken Spaghetti into a weeknight option, without compromising the flavor of the dish. The use of pre-cooked chicken is the key, lopping off about 30 minutes of cook time. I’ve used rotisserie chicken and Kirkland brand Grilled Chicken Breast Strips from Costco with good results. And recipe-ready chicken broth makes up for the lack of flavored cooking water you would have it you were cooking the chicken from scratch. 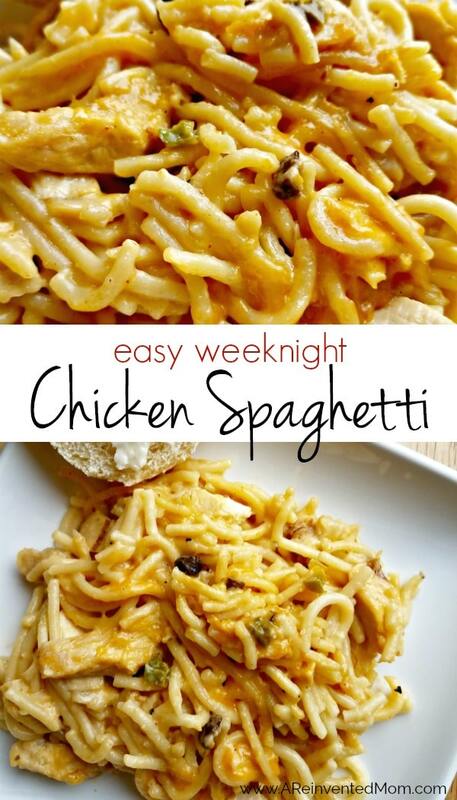 You can further simplify the process by preparing Easy Weeknight Chicken Spaghetti ahead of time. Prepping the night before or in the morning makes the after work scramble even less stressful. Follow the steps up to baking, then store the assembled covered dish in the refrigerator until ready to bake (I love these casserole dishes with lids for storing in the frig or freezer). Remove the casserole dish from the frig about 15 minutes before baking, remove the lid and pop the dish in the pre-heated oven. Lastly, don’t be put off by the baking time – it’s all hands-off time, allowing you to prepare your side dishes, a salad, spend time with your kiddos or simply unwind with a glass of wine after a busy workday. 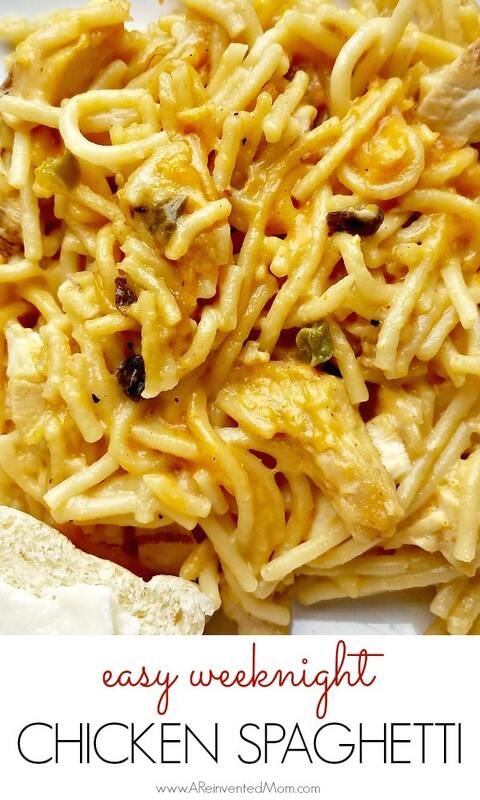 Although initially posted over 2 years ago,the original Chicken Spaghetti remains one of the most popular recipes I have shared on this blog. And it’s still a family favorite. Pyrex 9×13 casserole – I love my Pyrex casserole dishes. While the spaghetti is cooking, combine the pre-cooked chicken breast, 2 cans of soup, green pepper, onion, chicken broth, cheddar cheese (don't forget to reserve the 1/2 cup for later use) and Lawry's Season salt. Mix well. Add cooked spaghetti to chicken mixture and stir to combine. 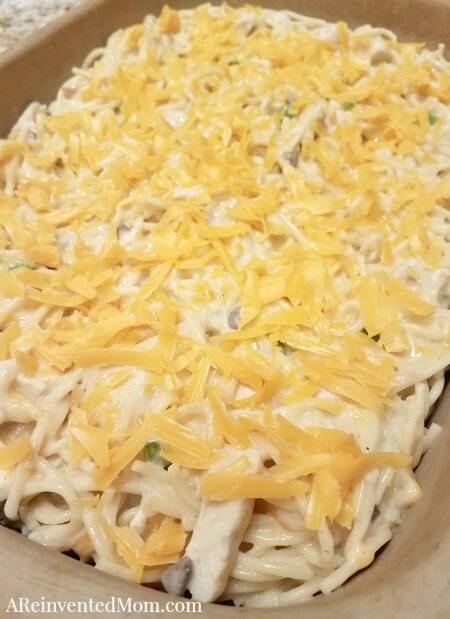 Pour mixture into a greased 9 x 13 casserole dish and top with 1/2 cup of reserved cheddar cheese. Bake at 350 degrees until bubbly, about 30 minutes. Recipe can be assembled the night before or in the morning and refrigerated until ready to bake, making an even easier weeknight meal. Remove casserole from frig about 15 minutes before baking. Bake as directed, allowing for additional baking time. 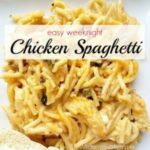 0 Response to "Easy Weeknight Chicken Spaghetti"